In April, a housefire destroyed our friends' home. Their family of seven lost almost everything they owned; it was a devestating time. Before we were given permission to gut what remained of the home, I took some pictures. It sounds morbid to snap photos of someone's misfortune, but they appreciate the pictures now. 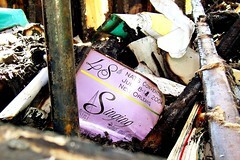 The family is very musically inclined and I found this admist the rubble - just one of their many ruined possessions.